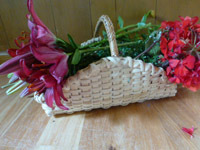 This is a beautiful and roomy basket that starts on a wooden base. incorporates chase weave, twining and 3 rod wale. Using Round Reed and seagrass, it culminates with a wrapped handle. Ply-split braiding is an ancient craft that camel herders in India have been practicing for hundreds of years, making girths for their camels. 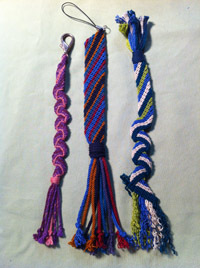 In the class you will learn two different patterns and go home with two key chains. This technique could be used to make jewelry, three dimensional objects, like baskets and I think it has potential to be used for handles on reed baskets. Students do not need to bring anything. I will supply gripfids, the tool to ply-split, for use during class. They may be purchased for an additional $10 after class if they so choose. 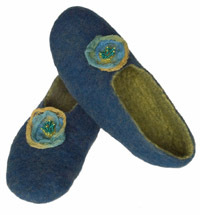 Cozy and warm, your new felted slippers are great for Minnesota winters. No knitting required, learn to layer colorful wool fibers over a custom-sized pattern made from your own feet. Choose your favorite look from elegant lounging slipper to casual backless mule. Either way, you’ll enjoy relaxing with your feet up in a pair of handmade felted slippers. Optional: apron, lunch or a snack. 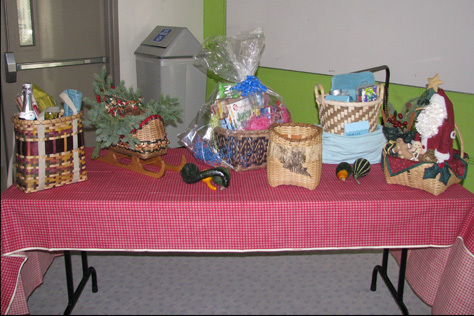 In this class students will be making 2 baskets using 1 base. The pitcher will be completed first using holes drilled in the slotted base and the saucer second, using the slot to complete it. This treasure woven of hand split Black Ash will be your mind's creation. A basic start up, then you create the rest - the size, shape and embellishment. 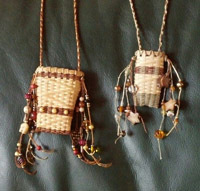 Finish with 3 or 4 braid neck cord and beads. 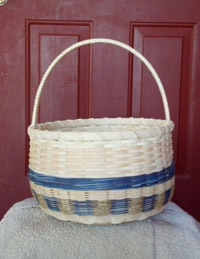 In this class you will learn the more versatile basketry technique. 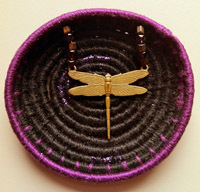 You'll create a pin or small shrine-like sculpture with your choice of shape and color. A variety of beads and charms are available, or you may bring your own favorites. Photo is an example, not a class sample. All levels of experience are welcome. Bring a pair of scissors. This sturdy and solid 2/2 twill can be woven using 7/8" natural or 3/4" smoked flat reed. Lay the horizontal spokes, then place a 10 x 12 D handle in 2/2 twill and weave vertical spokes to each side. The first three rows are woven at the same time so the basket takes shape quickly. Learn the braided handle technique. Rim using sea grass and waxed linen lashing. 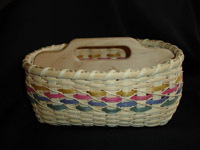 The basket is woven on a wooden preassembled base. Chase weaving is used to secure spokes in the base. Sides are woven with natural 3/16” f/o reed. Accent rows are ¼” dyed f/f reed and #2 natural round reed. The challenges with this basket may be shaping to hug the handle insert and learning to do the cross stitch accent. Pattern by Jeanie Wilcox. A Beautiful segmented oak and walnut hardwood base with two leather handles. This is a great basket for display or storage, a great size to put a project in. 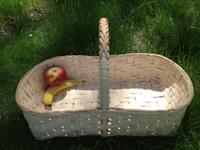 A small harvest basket perfect for the home gardener. 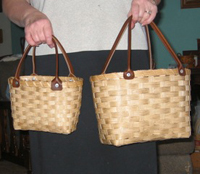 Use to carry flowers and veggies from the garden. The 15th annual Basket Bingo Fundraiser. Play bingo and win baskets! Come and enjoy fun door prizes, food and a raffle. Bring your friends and family, this event is always a lot of fun! Don't miss it! There will be a COL (Cost of Living) price increase in 2014. The Bingo price will be $15.00 for 15 game cards (30 games). The price will include a new TICKET RAFFLE; and as in past years, raffles on the table basket decorations and ALL the extra Bingo baskets! Ticket holders will also receive a door prize. Hot dogs, chips, vegetables and beverages will be available for purchase. Sweets and treats for FREE! 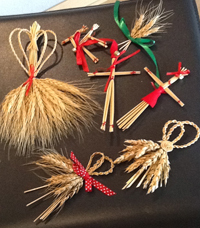 Scandinavia is often associated with Holiday Ornaments of wheat. Learn to make several plaits and create tomtes, juleboks, or ornaments to decorate your home, tree, table or packages this holiday season. This comes with a plastic liner which makes it very useful and sturdy. 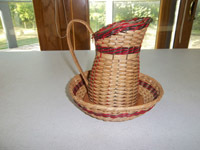 It is an easy basket to weave and you will learn how to rivet the leather handles onto your basket. I will also have a pattern for making the cloth liner which you may trace in class. Special Note: Shirley MUST have two week's notice on the number of class participants, so DON'T delay in signing up! PLUS: If you are placing an order from thebasketpatch.com, Shirley will bring your supplies to class so you won't have to pay shipping costs! Please bring a large paper grocery bag or a large sheet of paper for tracing the pattern for the cloth liner.